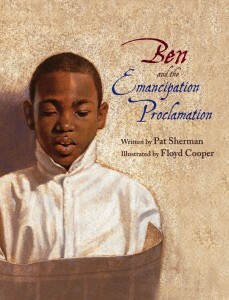 One of the loveliest books I’ve read in a long time is the lyrically-penned, exquisitely-illustrated picture book by Pat Sherman called Ben and the Emancipation Proclamation. It debuted back in 2010, and I still haven’t figured out how I missed this one. But at least I’m rectifying that today. Ben and the Emancipation Proclamation chronicles the life of a young slave named Ben who navigates the streets of Charleston, South Carolina by making out the words and letters that form the street names. Like most slaves of his day, Ben is forbidden to learn how to read. His father knows a little about reading, however, and teaches Ben what he knows just before he’s sold off to who-knows-where. Once his father is gone, no one else knows Ben’s secret except his ailing mother – or so he thinks. Ben is soon separated from his mother when he is apprenticed (a form of leasing) to the Bleekers of Charleston, who run a tailoring shop. Ben does all sorts of chores, including running errands to and from the store for Mrs. Bleeker, and it is during these excursions that he memorizes words and letters and teaches himself to read. When war comes to Charleston and Ben and other slaves are consigned to a slave jail, Ben begins to believe he’ll never use his reading skills again. Until the other slaves smuggle a newspaper into the jail and urge him to read what’s on the page. It is then that Ben realizes the secret he had – the secret about his ability to read – was never a secret at all. Word of his “gift of reading” has spread like wildfire, and slaves he barely knows stand around him in the patchy darkness, waiting for him to read. I have read this book three times now, and each time, Ben’s childish innocence, fearless determination and unyielding courage have brought many tears to my eyes. 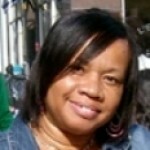 Author Pat Sherman’s prose is soft and sweet, yet it moves the reader like a whirlwind. Award-winning artist Floyd Cooper’s illustrations are quite detailed, from the authentic walls of a pre-Civil War dry goods store to the dusty street corners of a burgeoning city. Mr. Cooper uses warm and rich brown tones on every page, and expertly captures facial expressions and body language as he offers readers a glimpse into slave life at the dawn of freedom. This book is perfect for early Social Studies, Citizenship and World History classes, and can be used as a jumping off point for almost any educational activity, including discussions on intelligence, politics, child labor, and the inability to imprison the human mind.